Yesterday, my morning started with my with my usual routine – a check on the ‘Twitterverse’. There is always something interesting going on there, and this day was no different. I took note of a tweet from Donna Fry announcing her new blog post Changing the Trajectory. I always enjoy reading Donna’s blog as I find her writing thought provoking and insightful. This article inspired as anticipated, digging into critical aspects of student learning – learning is for ALL, learning is messy and sometimes very messy. Then there were “those words” that REALLY caught my attention: building capacity, personalized learning and towards the end of her article a strong statement of importance of Assessment data + Thinking, collaborating teacher + Technology. This last statement fit nicely with a diagram I had sketched various of versions of on my office whiteboard. These words capture the essence of what I think of as Technology Enabled Learning (TEL). The journey is all about student learning. The use of technology should not interfere with best instructional and assessment practices. We should not use technology because it is there or perhaps new, but use it in ways that make a difference in the learning. I am a believer in a thoughtful approach to the use of technology in the learning process and encourage educators to familiarize themselves with both the TPACK model as well as the SAMR model. 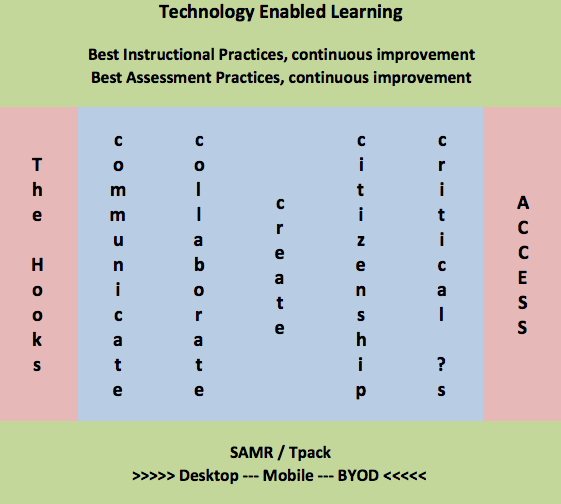 The C’s, as often described in 21C learning references, provide what I think of as key “hooks” for leveraging the potential of technology for learning. All to often, I think we get caught up in thinking about the hardware …. desktops, operating systems, mobile – laptops, netbooks and tablets. Ah yes, and don’t forget about the bring your own option. In the end, these devices are well, simply devices. Today, the rate of change in technology is staggering. Devices will come and go, improve, get faster, and have more capabilities. If we are lucky, the price of a device suitable for student learning will continue to drop in price over time. In the spin of the “device of the day”, we do have to learn them and design support models. BUT, we need to be prepared for change as the churn of hardware development and operating system advances will never stand still. The focus must remain on best instructional and assessment practices and how we use technology to support and enable learning, and not what the technology of the day is. I have attempted to capture a way of connecting these ideas in the diagram below. I appreciate the timing of Donna’s publication, that she wrote such an insightful article and created an opportunity for me to share how some of my thinking and learning as it links to her learning.